Aego Sound3ar review: can a sub-soundbar system that costs less than £200 deliver? And, furthermore, can it deliver in a living room or study? So the quick takeaway with the Aego Sound3ar is that it is a well-made, versatile and easy to use sound system. You can hook it up to your PC or TV and, after dropping less than £200, feel really smug that you've gone and improved your audio setup immensely. The caveat we would argue, however, is that this system is not designed for large spaces, with the system lacking the necessary power and volumousness to compete with more complex (and expensive) systems. If you want a simple, no-nonsense solution for a living room or study however, then the Aego Sound3ar comes highly recommended. The Aego Sound3ar is an evolution of the existing Aego3 sound system, with the sub-soundbar designed specifically for use with modern flatscreen TVs and personal computers. Acoustic Energy have taken the 65W subwoofer from the Aego3 and instead of partnering it with a pair of satellite speakers have instead paired it with a small form factor soundbar. The soundbar itself measures in dimensions-wise at 70 x 500 x 70mm and wraps a cool-to-the-touch and pleasingly stylish aluminium casing around a slick black mesh. In the bottom-centre of this grille lies an Acoustic Energy nameplate. The contrast between the shiny, smoothly cut alumium casing and the matte grille radiates class. 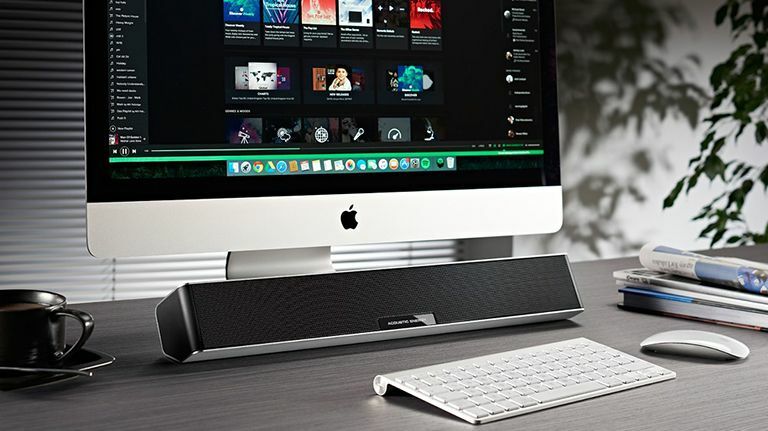 Sticking with the soundbar, it can be placed in two ways, either sitting on a desk or TV stand on a pair of rubber plates - which help reduce movement if knocked - or hung from a wall, with a pair of mounting holes located on the back of the casing. If you place the soundbar on a surface, its speaker array is angled upwards on a 30-degree slant. The soundbar, which is passive, is connected to the subwoofer via an included RCA cable. Which, brings us onto the brains and power of the system, the subwoofer. Unlike the soundbar, the subwoofer does not sport an aluminium casing, with a matte-black composite preferred. While the sub has weight, we didn't warm to the look or feel of the casing up-close as it didn't say premium like the soundbar. Regardless, the casing is attractively sculpted, with smooth curved corners and another front-facing tasteful black grille. At the top of the grille lies a shiny black display panel, upon which the system's power, connections and volume indicator lights can be found. The panel is not touchscreen, requiring you to use the remote to actuate its functions. When you press a corresponding option on the remote a LED light or, in the case of volume changes, series of LEDs light up, giving you visual feedback on the change. Ultimate man cave tech: need to build your very own bloke's sanctuary? In terms of possible connections, the subwoofer allows you to connect your TV or computer via either standard 3.5mm aux cable or via digital optical, with both cables supplied in the box. The system's ports are located in a recess at the lower-back of the sub, with each port orientated downward. This is a welcome design feature, as it helps keep things nice and tidy. As well as these wired connections, the Aego Sound3ar can also be connected to via Bluetooth, with a simple press of of a pairing button on the remote allowing you to connect a smartphone, tablet or other Bluetooth-enabled device. This added wireless capability adds yet another dimension to the system, increasing its versatility. Which connection is in operation is altered by the Sound3ar's remote which, if we are being honest, is the weakest part of the package here - it just looks and feels cheap. Functionality is pretty consistent though at accute angles and range is OK, so it's not the end of the world. While we are on the remote, this is also where you can increase or decrease the subwoofer's bass output, with both plus and minus buttons. In terms of sound quality we were impressed with the output from the Sound3ar, which while lacking that enveloping quality you get with more expensive systems, was suitably rumble-tastic at the low-end, balanced across the mid-range and crisp and precise at the high-end, with voices and environmental details in music, films and video games pleasingly distinctive. What's more, shifting the system around was incredibly easy which, in our eyes, is another plus point for a system such as this. Its portability and ease of setup separates it from other larger, heavier and more complex systems that demand a level of entrenchment within a space that makes them impractical to move, restricting their usage scenarios. The Sound3bar, in contrast, takes minutes to setup and take down again, and is lightweight and compact too. Considering its price we think the Aego Sound3ar is a very attractive proposition for many people. It's simple to set up, easy to use and delivers good audio fidelity that will deliver in most people's homes. The truth is though that, for more money of course, you can get a better and more audibly complex sound system. The questions you need to ask yourself, therefore, are how much money are you willing to spend on a sound system and, probably more important still, what are you going to use the system for and where will it be placed?